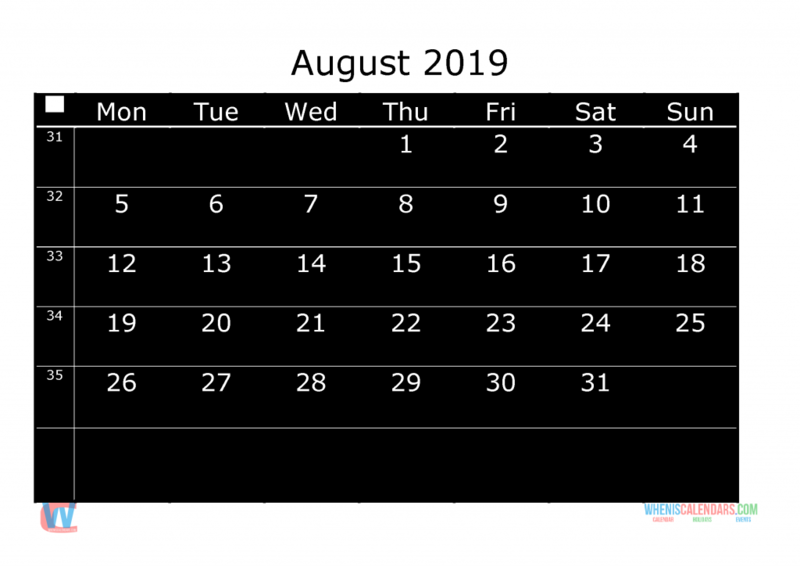 Printable Monthly Calendar 2019 August, the first day of the week is Monday, week numbers including. August 1st, 2019 is a Thursday. It is the 213th day of the year, and in the 31st week of the year (assuming each week starts on a Sunday), or the 3rd quarter of the year. There are 31 days in this month. 2019 is not a leap year, so there are 365 days in this year. The short form for this date used in the United States is 8/1/2019, and almost everywhere else in the world it’s 1/8/2019. Below you can 2019 Calendar with week numbers printable, one month on one page, high quality design with clear font.